Welcome to the Special Collections Department! The Special Collections Department’s librarians and staff are dedicated to preserving unique and valuable research materials while providing access to these primary resources to the University of Miami students and faculty, and visiting researchers from around the world. The Kislak Center Reading Room is open from 9 a.m. to 4 p.m. Monday through Friday. It is closed weekends and University holidays. 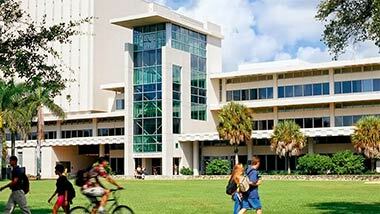 For those readers not affiliated with the University of Miami, please notify us of your visit. A pass will be prepared and await your arrival. Directions to the Otto G. Richter Library, where the Special Collections Department is located, can be obtained here. Aeon allows researchers to submit requests for items in the Special Collections Department. Researchers will now be able to register and manage personal information and track requests from any computer using the Aeon system. Materials may be used only in the Kislak Center Reading Room. Access to certain collections or portions thereof may be subject to specific restrictions. In some instances, readers may be required to use microform, digital, or other copies of materials. Readers must present photo identification that will be held at the the Special Collections Department reference desk until materials are returned. Users will be asked to abide by standard special collections guidelines while using materials in the department. All materials must be handled with great care. Only pencils may be used in the reading room; pens, highlighters and other writing instruments are prohibited. Food and beverages are not permitted in the reading room. In consideration of others, please mute cell phones and beepers. Users who do not abide by these rules or who mishandle materials will be denied further use of the collections. Prior to your visit you can search the online systems to locate needed materials. You can find books, archives, and manuscripts housed in special collections by searching the library catalog, the University of Miami online catalog. If an item in the catalog is located in the Special Collections department, the record in IBISWEB will display an option to “Request This Item Via Aeon.” Once you are registered with Aeon, you will be able to immediately access the Aeon special collections materials request form by clicking the IBISWEB “Request This Item Via Aeon” option. You will then be able to submit the request and keep track of this and any other future requests in your Aeon account profile. You can also find manuscripts and archives through special collections online Finding Aids. Once you find the Manuscript and Archival Collection you are looking for in the database, you can request materials from individual collections via Aeon. A link in the finding aid will direct you to a materials request form in Aeon, the new special collections circulation management system. Proper credit needs to be assigned to all published materials. Citations should include full bibliographic information and read: [Collection Name – if applicable], Special Collections, University of Miami Libraries, Coral Gables, Florida; OR Courtesy of the Special Collections, University of Miami Libraries, Coral Gables, Florida. Seating in the Kislak Center Reading Room is available on a first come, first serve basis, although efforts will always be made to accommodate all users. We require that all briefcases, backpacks, notebooks, packages, purses, umbrellas, and other personal items be placed in designated lockers. Bags, notebooks, folders, etc. are subject to examination upon departure. In the interest of providing optimum access and a comfortable reading room environment for researchers, no children under the age of 12 are allowed, even in the company of an adult.